Our Mission Is To Help You Breathe Easy In The Big Easy! Board Certified Allergist & Immunologist. Our New Uptown Office is NOW OPEN! See Dr. Sonia Kamboj of Breathe Easy Allergy in the News. Check the Pollen Count in Your City Today! Are Allergies Impacting Your Quality Of Life? Breathe Easy Allergy & Asthma may be your solution. Our clinic offers state-of-the-art equipment to help you find a pro-active, comprehensive approach and to help you select the treatment that is the best fit for you, your family and your lifestyle. 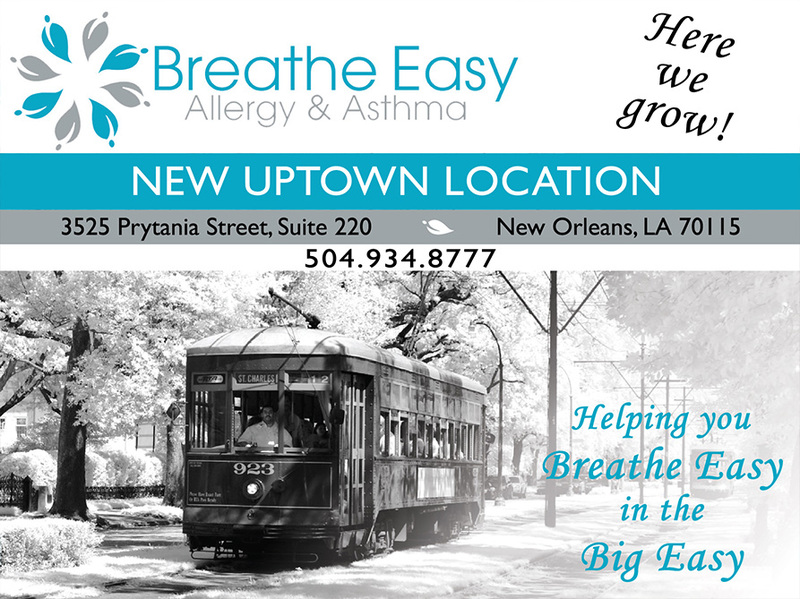 With locations in Westbank and Uptown New Orleans, Breathe Easy Allergy & Asthma is a family-focused practice with specialized expertise in treating all types of allergic diseases, including nasal allergies, respiratory issues, skin problems, chronic sinusitis and food allergies. Our treatments have helped to change the lives of hundreds of families, and we look forward to treating hundreds more. Simply stated, our mission is to help you breathe easy in the big easy!